TORONTO - With Josh Beckett due to come off the disabled list today and make his first start of the season, the Red Sox will be forced to make a roster move. Though the team did not make an official announcement after yesterday's loss to the Blue Jays, Kyle Snyder confirmed that he will be designated for assignment. The Red Sox, who originally claimed Snyder off waivers from the Royals in June 2006, will have 10 days to make a move with the pitcher, either by trading him or waiting for him to clear waivers, at which time he could accept a trip to Triple A. He could not be sent directly to the minors because he is out of options. Snyder's two outings this season did not go well. He pitched a third of an inning yesterday, walking the first two batters he faced; Bryan Corey allowed both runners to score. That followed Snyder's 1 1/3-inning outing March 25 against Oakland in Tokyo, when he allowed two runs on two hits, including a home run. The 6-foot-8-inch righthander has started and relieved for the Red Sox, and he replaced Tim Wakefield on the World Series roster last season though he did not pitch in the sweep. He did spend the entire season with the Sox, though, going 2-3 with a 3.81 ERA in 46 appearances, all in relief. In 2006, he started 10 times in his 16 outings for the Red Sox, going 4-5 with a 6.02 ERA. He has mostly been used in long relief, a role that also is filled by Julian Tavarez. That apparently made Snyder a candidate to go, with the team holding on to Corey, David Aardsma, and Javier Lopez. But those pitchers also could be vulnerable, as the Sox will have to create another spot on the roster when Mike Timlin comes off the disabled list. Corey, Aardsma, and Lopez also are all out of options, and cannot be sent directly to the minors. Though it's not quite the matchup that it might be later in the season, Beckett will face Roy Halladay in today's game, the last before the Sox finally head to Boston for their own home opener. Beckett went five innings in a simulated game in his last outing in Fort Myers, Fla., so his pitch count will be monitored. But the Sox are glad to get him back. "We know he's not going to pitch a complete game," manager Terry Francona said. "He's not ready to do that. Nice to get him out there. I think our team feels good when he's out there, even if it's coming out of spring training a little later than everybody else. He's worked so hard. We obviously want to win, and he's going to have to be sharp because we know how Halladay throws, but just to have him out there will be a big step forward for us." 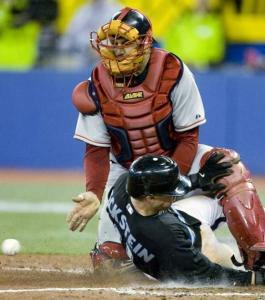 Catcher Jason Varitek said, "He's got to give us a quality start. That's what we're looking for, to be able to go out there and let this team kind of keep grinding." The Sox have announced the schedule for Opening Day Tuesday, when they face Detroit after coming home from a three-country road trip. The gates will open early, at 11:35 a.m., and the ceremonies will begin approximately an hour before game time, which is listed at 2:05 p.m. Things begin with a parade of flags on the warning track by the Green Monster, representing Red Sox Nation members and fans who have sent letters and emails to the team about their passion for the Sox. The players will receive their World Series rings, and the championship banners will be displayed. The Boston Symphony Orchestra will play during the ceremonies, and will perform the national anthem. The Sox recommend that fans take public transportation to the game, given the lack of parking on a weekday afternoon . . . Timlin had a bullpen session yesterday, before heading to Pawtucket for appearances tomorrow and Wednesday . . . Coco Crisp started in center field, with Jacoby Ellsbury on the bench. Crisp went 0 for 4. Julio Lugo led off, getting an infield hit in four at-bats. Francona acknowledged that Lugo enjoys leading off, but the team needs players to reach base ahead of David Ortiz and Manny Ramírez, which means Lugo isn't going to be in that spot regularly, since his on-base percentage is not nearly high enough (.294 in 2007) . . . Ramírez's first-inning double produced the 1,610th RBI of his career. That moves him past Goose Goslin for 27th place on the all-time list . . . The Sox have lost their last five games in the Rogers Centre. Their last win here came May 10 of last season. The Sox are also 23-34 against Toronto dating to the 2005 season. That's the most wins by a Boston opponent in that time.